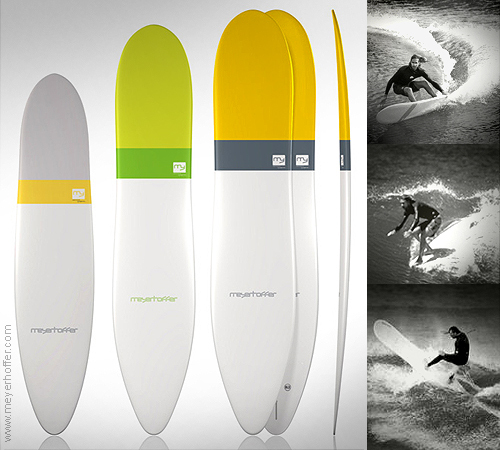 The Meyerhoffer 2 keeps the performance advantages of previous versions but with more glide and trim for smaller waves. By moving further back the wide point of the board, its shape delivers a shorter rail, rounder and centred around where you stand. It is basically applying an outline of a shortboard to the back of the longboard. You get the advantages from both. Fast, responsive and easy to turn, but at the same time it paddles, glides and noserides effortlessly. The convex section at nose area allows for speed, fluidity and quick rail-to-rail transitions. Double Spiral V bottom for speed and rail-to-rail transitions. Aggressive rails deliver grip in steep waves.